This is a time to focus on filling our lives with love, for ourselves and for others! If you’re in a relationship, this reading will reveal ways to deepen your connection and open the lines for greater expression of your love. If you’re not with anyone, we will examine the ideas of loving yourself unconditionally and opening the path for greater love from others. Rather than trying to snag the perfect match, this reading focuses on ways to let all of your best traits shine so every relationship in your life benefits, and you’re more likely to find great friends and compatible partners. Note: This reading will not be done to draw in a particular person; it is designed to bring more loving energy into your life. 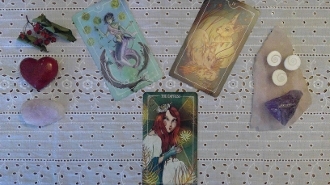 If you are looking for a reading on attracting a specific person, please consider a pre-working reading, a love-avenues reading, or a three-card reading adapted to your situation. ******************Please note in special instructions your current relationship status as well as your full names and dates of birth. ****Listing is for a three card reading.